As Lesson Number One i will take on Oracle Real Application Cluster Basics . Oracle RAC allows multiple computers to run Oracle RDBMS software simultaneously while accessing a single database, thus providing a clustered database. In a non-RAC Oracle database, a single instance accesses a single database. The database consists of a collection of data files, control files, and redo logs located on disk. The instance comprises the collection of Oracle-related memory and operating system processes that run on a computer system. In an Oracle RAC environment, two or more computers (each with an instance) concurrently access a single database. This allows an application or user to connect to either computer and have access to a single coordinated set of data. Assume the installation of Oracle 10g release 2 (10.2) RAC on Red Hat Enterprise Linux 4. Access to a public network. Oracle RAC relies on a shared disk architecture. The database files, online redo logs, and control files for the database must be accessible to each node in the cluster. The shared disks also store the Oracle Cluster Registry and Voting Disk (discussed later). There are a variety of ways to configure shared storage including direct attached disks (typically SCSI over copper or fiber), Storage Area Networks (SAN), and Network Attached Storage (NAS). Each cluster node is connected to all other nodes via a private high-speed network, also known as the cluster interconnect or high-speed interconnect (HSI). This network is used by Oracle’s Cache Fusion technology to effectively combine the physical memory (RAM) in each host into a single cache. Oracle Cache Fusion allows data stored in the cache of one Oracle instance to be accessed by any other instance by transferring it across the private network. It also preserves data integrity and cache coherency by transmitting locking and other synchronization information across cluster nodes. The private network is typically built with Gigabit Ethernet, but for high-volume environments, many vendors offer proprietary low-latency, high-bandwidth solutions specifically designed for Oracle RAC. Linux also offers a means of bonding multiple physical NICs into a single virtual NIC (not covered here) to provide increased bandwidth and availability. To maintain high availability, each cluster node is assigned a virtual IP address (VIP). In the event of node failure, the failed node’s IP address can be reassigned to a surviving node to allow applications to continue accessing the database through the same IP address. There are many different ways to configure the hardware for an Oracle RAC cluster. Our configuration here uses two servers with two CPUs, 1GB RAM, two Gigabit Ethernet NICs, a dual channel SCSI host bus adapter (HBA), and eight SCSI disks connected via copper to each host (four disks per channel). The disks were configured as Just a Bunch Of Disks (JBOD)—that is, with no hardware RAID controller. An Oracle Automatic Storage Management (ASM) instance (optional). Oracle RAC is supported on many different operating systems. This guide focuses on Linux. The operating system must be properly configured for the OS–including installing the necessary software packages, setting kernel parameters, configuring the network, establishing an account with the proper security, configuring disk devices, and creating directory structures. All these tasks are described in this guide. Oracle RAC 10g Release 1 introduced Oracle Cluster Ready Services (CRS), a platform-independent set of system services for cluster environments. In Release 2, Oracle has renamed this product to Oracle Clusterware. Clusterware maintains two files: the Oracle Cluster Registry (OCR) and the Voting Disk. The OCR and the Voting Disk must reside on shared disks as either raw partitions or files in a cluster filesystem. This guide describes creating the OCR and Voting Disks using a cluster filesystem (OCFS2) and walks through the CRS installation. 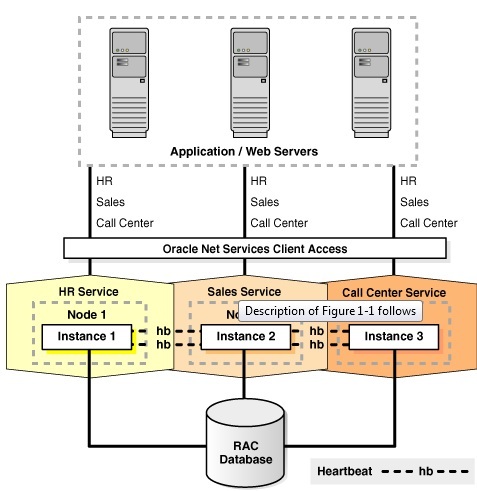 Oracle RAC 10g Release 2 software is the heart of the RAC database and must be installed on each cluster node. Fortunately, the Oracle Universal Installer (OUI) does most of the work of installing the RAC software on each node. You only have to install RAC on one node—OUI does the rest. Oracle Automatic Storage Management (ASM) / Or other shared Storage . ASM is a new feature in Oracle Database 10g that provides the services of a filesystem, logical volume manager, and software RAID in a platform-independent manner. Oracle ASM can stripe and mirror your disks, allow disks to be added or removed while the database is under load, and automatically balance I/O to remove “hot spots.” It also supports direct and asynchronous I/O and implements the Oracle Data Manager API (simplified I/O system call interface) introduced in Oracle9i. 1-Crossover cables are not supported (use a high-speed switch). 2-Use at least a gigabit Ethernet for optimal performance. 3-Increase the UDP buffer sizes to the OS maximum.